This one works for me. Prof, pls what’s the venue and time for Techfest. I received invitation email yesterday but I didn’t see venue and time, also it was not stated whether i should come for 15 or 16 although i applied for 16th. The venue is landmark Center in Lagos. It is a two days program. So prepare to come for the two days. Thank you Yomiprof for the 9mobile magic SIM I’m even running a hot-spot for my whole family. I was enjoying it before, just last month it stopped working for me. The highest I can get is 1.5gb which the normal is 750mb and bonus is 750mb. I am not a fan of Airtel. 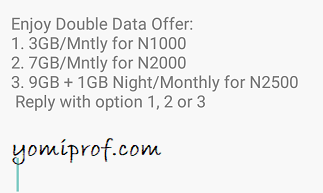 Thanks Prof.
MTN double data cheat is out and working again. Click on my name for it. Still rocking my mtn double data and ntel 500% bonus. I don’t even know were I kept my airtel sim. Airtel is just going front and back. This double data was there b4 but they later stopped it. I experienced the same thing. I subbed 1k instead was given 1.5 gig. Thanks for the info prof. Mine start from 7GB for 2000, 9GB+1GB night for 2500 and 11GB+1GB night for 3000. I really don’t know why airtel enjoys making there services sim selective. Something that everyone should have access to, they will enable for in some and not in others.